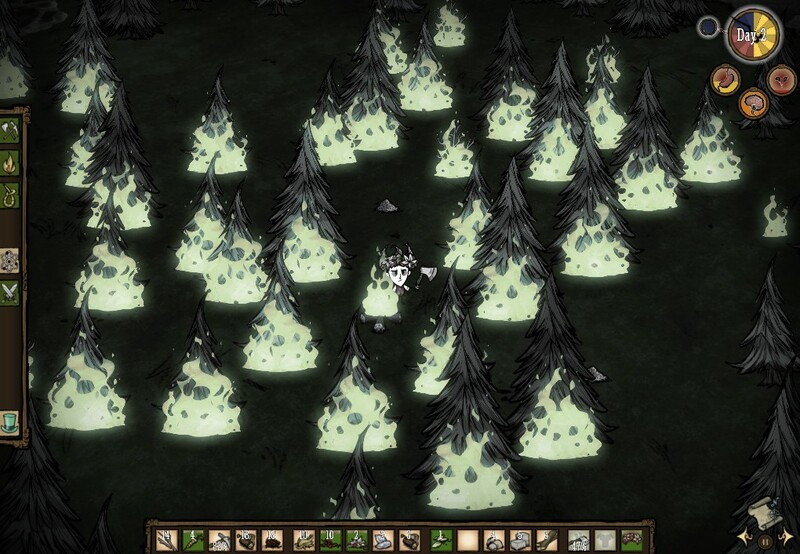 Don’t Starve: the latest game from Klei Entertainment is out today, after several months of beta testing. I did a spotlight just as the beta was underway and since then, the game has gone through a number of big changes. Because so much has changed since my spotlight, I’m going to go over the basics of the game again. 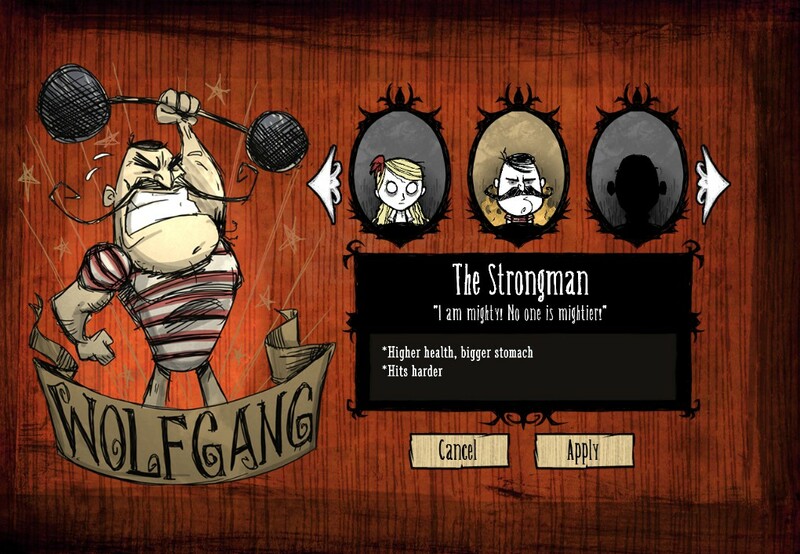 In Don’t Starve, you have been trapped in a wilderness dimension by a strange man who goes by the name: Maxwell. Your goal is to survive and hopefully figure out what is going on. Every day you need to gather food and materials that can be used to craft new items to help you survive. Every night you must set up a fire to protect yourself from the darkness as there is something out there that will get you otherwise. Since the original spotlight the developers have added in more items, equipment and enemies in terms of content. There are also new challenges in the form of adventure mode: where the player must find magical items that can be used to create a portal to hopefully freedom from several themed worlds. The weather is now a factor with snow and rain a possibility that will affect your health and available materials. Food: which was previously very easy to obtain and stockpile, now spoils over time. 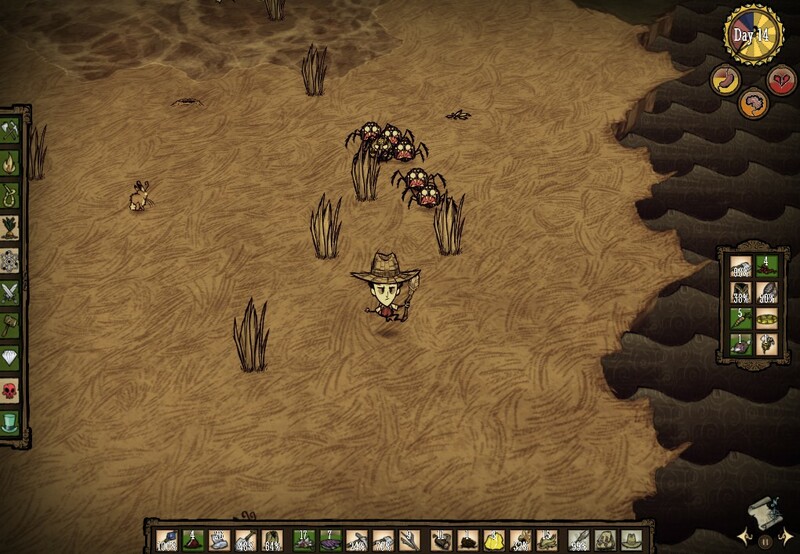 This forces players to manage when they harvest food or find ways to preserve them. Unlocking new items, which was one of the biggest areas of grind in the beta has also been updated. Before, the player had to destroy items to earn science points which were used as currency to unlock new items to be built. Now, in order to unlock items you have to first build them while near one of the science structures. Once you’ve done so, you can then build them anywhere you want as long as you are carrying the required materials. Tip: Poking things with a spear is a sure fire way to make them angry. At the start, you’ll choose a character (with more unlocked as you play) and you can adjust the variables of the world to make the randomly generated world easier or harder. Each character has several differences to them which while won’t massively change how you play, will still have an impact on your strategy for surviving. What makes Don’t Starve stand out is that this type of gameplay is rarely seen these days, especially taken to such a challenging degree. When I interviewed Klei a few months ago one of the sources of inspiration was from the DS game: Lost in Blue: where you had to survive on a deserted island. An island may be a safer place as the woods of Don’t Starve have some bite. 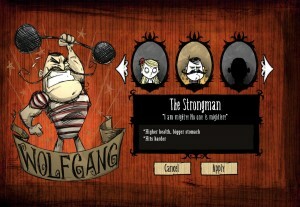 Don’t Starve is a challenging game as evident by the title. There are no instructions or tutorials to go by and as mentioned you could die the very first night of playing without a fire. The woods are full of all sorts of creatures and the only way you’ll know a friend or a foe is to go up to them… and maybe poke them with a spear. The difficulty of the game escalates as you survive each night. As time goes on, more dangerous enemies will start to appear and the as-mentioned weather effects will kick in. In this regard Don’t Starve has a sense of urgency, unlike Minecraft you are never truly considered safe. When winter hits, you’ll be forced to change up your strategies and equipment to survive the cold. As you find and hopefully kill more dangerous enemies, you’ll be able to use the materials to create better items to help you survive. Once the game starts it never lets up as you’ll have to balance your limited daylight time between exploring, gathering and fighting. If you fall behind you may get attacked by something you can’t fend off and you only have one life… most of the time. Exploring is where more of the game’s rogue-like design is seen. Many items have multiple uses which the game will not tell you about. The only way to know for sure is to experiment on your own and keep that knowledge for the next game. Once you understand the basics of the game, it will become easier to survive and get situated in the early game. Design wise there isn’t a lot for me to criticize as the developers have gone over the game numerous times during beta and even missed their original launch date in the process. I only have a few nitpicks, with one being no fault of the game. Personally I’m not a huge sandbox genre fan as I prefer to work towards goals instead of endless play. While Don’t Starve‘s adventure mode does somewhat alleviate that, I do wish that there were more things to work towards besides unlocking new characters. Also, the adventure mode has to be found during survival mode which means depending on the map generation, it could be awhile before you play it. Unlock-able characters are both rewards for playing and a way of adding more variation to the gameplay. 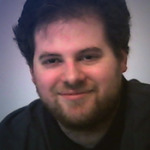 The other problem is that while the designers have done their best to eliminate as much grind as possible, there is still some present due to the progression system. The bulk of advanced items and structures are built by refining the basic materials of the land (wood, grass and rocks). You’ll still need to spend time gathering these materials even when you are building the third tier (and up) of items. Because refining uses up several pieces of materials, you’ll have to keep gathering them to stay in supply. This also makes the beginning of the game start to feel repetitive as once you know what you are doing; the same things to search for will work every time. If you get unlucky with the world generation, you may run into a case where a lot of the items would simply be unavailable to you and limit your tools. This is made worse when running the themed worlds for adventure mode, as not finding the right materials can make things unintentionally harder. One possible solution would be if you could build alternate versions of the same items with different materials, that would help in adding more variety to the basic goals. But being able to alter the attributes of the world does help give players more control of how difficult the game is and adds variety in that regard. 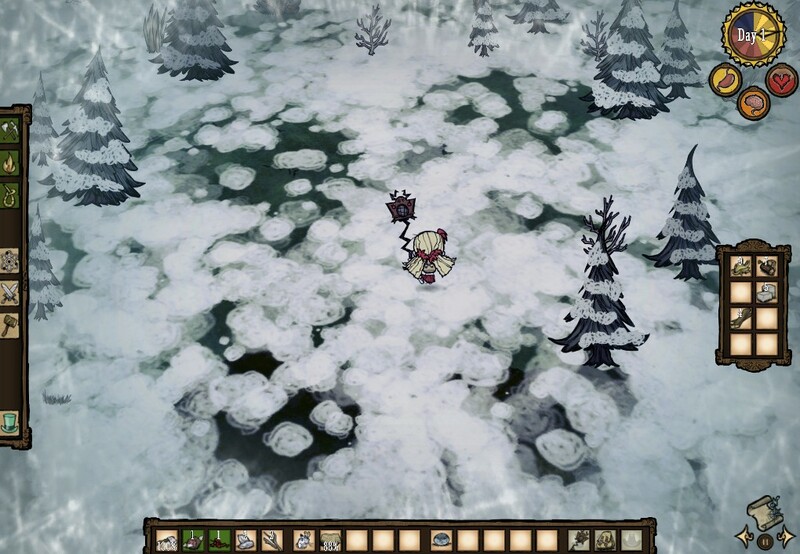 Don’t Starve is one of those titles where the designers set out to do something different and succeeded. The distinctive art style and survival-focus gameplay was a great combination. With promise of more content coming in the next six months, hopefully the world of Don’t Starve will become bigger and better… and of course more dangerous.